I thought Miss Bee had blogged once about watching Super Size Me but I guess not. Well, we did. And it was intense. We don't eat fast food anyways, but we had been known to indulge in the occasional Dr. Pepper. Since the movie, neither of us has had a soda - it's a terribly sugary substance that has no redeeming nutritional benefits. When I came across the page about what it does to your body I thought I better pass it along to anyone who cares. By the way, most recommendations for kicking soda are along the lines of: lemonade, ice tea, lemonade with ice tea (Arnold Palmer), sparkling water with citrus, etc. Just stay away from the high fructose corn syrup whatever you do. In a manner of speaking. "Made" is a bit strong. I used Google Sites to make a few little pages about beer, just to try it out. Sites is super easy to work with; if you want to make a place online where people can go to check out new information or even work as collaborators, and a blog seems too cheesy (or not helpful), definitely check Sites out. If you're coming to the Stare on the actual webpage, scroll through the top two posts to get to my Afro-Pick post. I started it before those others so apparently the want to post it down below them. Whatever. It's good stuff, so get to it. Extremely interesting article in the New Yorker about itching and scratching. Fascinating throughout. It's by Atul Gawande, an excellent writer that happens to be a doctor. Miss Bee says his book Better is "wonderful". 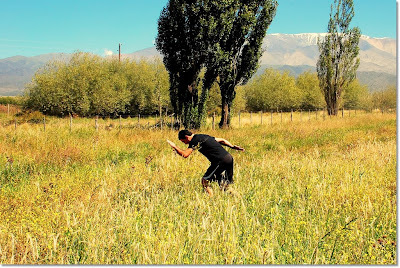 Read all about itching here. ...the feelings people experience in their phantom limbs are far too varied and rich to be explained by the random firings of a bruised nerve. People report not just pain but also sensations of sweatiness, heat, texture, and movement in a missing limb. There is no experience people have with real limbs that they do not experience with phantom limbs. They feel their phantom leg swinging, water trickling down a phantom arm, a phantom ring becoming too tight for a phantom digit. Children have used phantom fingers to count and solve arithmetic problems. Also, there's the tale of a woman who scratched through her scalp, skull, and into her brain. In her sleep. And if that doesn't interest you, I'm don't know what I can do..
You might not agree with his politics or style, but this is some great commentary on baseball versus football terminology. So my idea of focusing posts in long form on one musical artist really fell by the wayside. I am also spending far too much time working on these long posts with entire mixes, complete with all the uploads, etc. It's taking up a lot of my online storage resources as well. So I'm going to transition to shorter mixes, mix up the format a bit etc. But I'll try to keep the Pickle mixes coming as well. This week we venture over to Africa, specifically Nigeria. I wrote once before in a long post about Fela Kuti, check that post out for some more recommended sites and a few downloads. I believe all the music links still work. I spoke a bit about Afro beat there, so I won't get too windy again, but he pioneered and popularized the genre, fusing jazz, R & B/funk, and African rhythms into one heavy style. Today we got what I like to call "Afro-Pick: Pickle's Afro-beat Favorites". 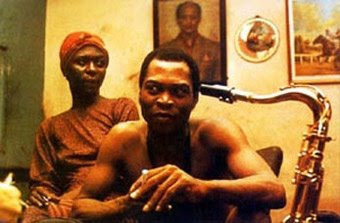 Fela sitting in his home, called the Kalakuta Republic. 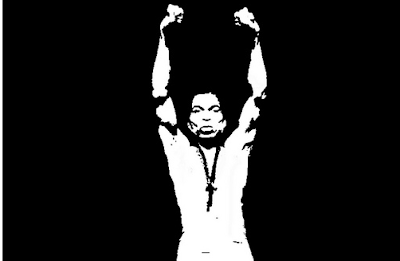 At one time, Fela declared his compound to be outside the jurisdiction of the Nigerian government. Needless to say, they didn't get along very well. 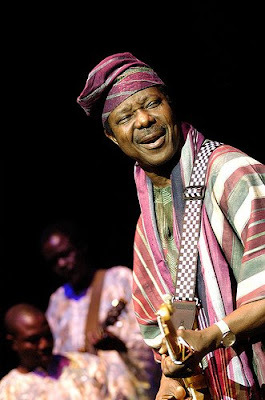 Up next is King Sunny Ade. While not an Afro beat musician, he was the face of juju music, a direct precursor to Afro beat, along with Nigerian highlife music, which we'll cover a bit of. Track 3 is again not Afro beat, but a contemporary and another major player in African pop music, mbalax in this case. 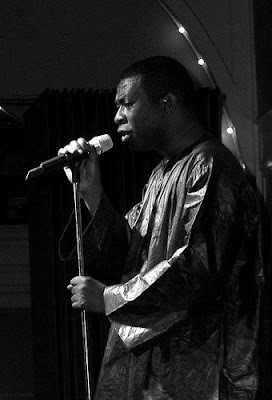 Mbalax was a Senegalese creation, very similar in style to Highlife, but I could find a picture of Youssou N'Dour. Just know that highlife is quite similar, if not usually this insistent. Neither is mbalax, I chose a very Afro beat-y jam to showcase. Next up is some down and dirty Afro beat from a songwriter named Jingo. Little is known of the band, and I can't determine the origins. I imagine this would be Nigerian. It's just about a perfect example of original style Afro beat so I've posted this one for streaming as well. Next up are the Lafayette Afro Rock band, known for their song "Darkest Light" which was sampled by Public Enemy among others, and another track from the compilation where I obtained "Fever". Download the mix to check them for yourself. Clearly a charismatic gentleman. Sir Shina Peters on stage. Tracks 9-11 are absolute bangers. All three are majorly heavy African funk bangers, the dirtiest of the dirt. Please do yourself a favor and download the mix to check these swingers out. "Afro-Pick" finishes up with another Fela jam, the first song from the "'69 Los Angeles Sessions" collection of pre-debut album songs. Great look at early Fela Kuti, and relatively short too. Listen up to "My Lady Frustration". 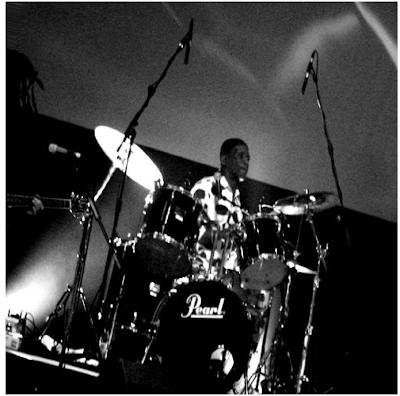 Tony Allen, drummer for most of Fela Kuti's bands. Now a bandleader and elder statesman of sorts for the neo-Afro beat scenes. 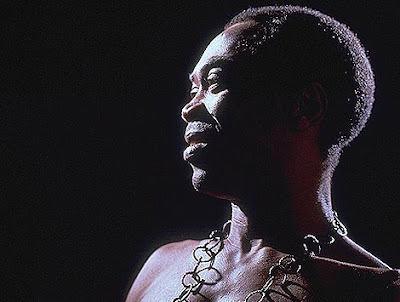 There is an absolute ton of information available about Fela and his legacy. Please check out some of the sites I posted in my original post (link available at the top of this post). 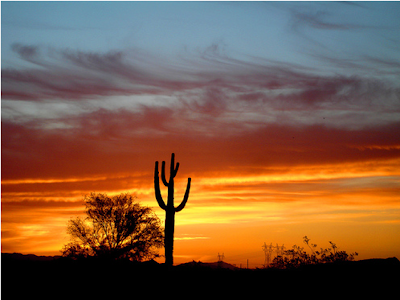 Also, a favorite blog, Diddy Wah, just posted a few Felas on his blog. Check them out here. This is part one, looking at the origins and early/golden years of afro beat. Look out sometime next week for part two, focusing on the bands that have internalized the afro rock stylings, mostly modern. We finally turned the air conditioner on last night. After two weeks of hitting 100+ during the day, it was no longer even cooling down much at night. Goodbye to seven months or so of having no temperature control whatsoever. In my "What We've Been Reading" post I forgot about a book that I started the next day, from the Tempe Library. It's called "Altruistic Armadillos, Zenlike Zebras", and it's by a fellow named Jeffrey Moussaieff Masson. It's really engaging, looking at 100 different animals, writing a few pages about each, and injecting personal feelings into usually dry subject matter. In the section on gannets, I found out that Bass Rock near North Berwick, Scotland is considered by no less a nature expert than David Attenborough to be one of the twelve wildlife wonders of the world. Check out the Bass Rock wikipedia page for more information. Here are my photos of Bass Rock, taken mostly from North Berwick golf course. This one's from town, with the dyke in front protecting the road during high tide. The seabird center in town. Inside there is a bunch of CCTVs broadcasting from Bass Rock, so anyone can watch the estimated 150,000 gannets, cormorants, eider duck, gulls, and other seabirds that congregate on the rock. Bass Rock, although volcanic in origin which could theoretically explain the coloring, is actually colored white on top due to the large volume of bird droppings, which release a staggering amount of ammonia into the air and sea over and around Bass Rock, which is about a mile away from the mainland. Sorry for the sideways photo. This is my dad hitting his first shot on the par 3 ninth hole. According to our caddie Doogie, the ship in the background is a passenger ferry, and would be heading for Continental Europe, probably Bruges in Belgium. Here's one of those damn gannets, barking like crazy on the road dyke. They're quite loud. Finally, the rock from further up the beach near the hotel where we stayed. This would be a point north and west of the golf course, closer to the landmass known as Craigleith. Here's a link to the Scottish seabird center in North Berwick (pronounced Berr-ick). 1. The World Without Us by Alan Weisman. Self-explanatory. What would the world be like without humans. Non-fiction from the library. 2. On Ugliness, by Umberto Eco. A compellingly thorough look through social opinions of ugliness, starting with the ancient Greeks. This one's going to take some time. Miss B. bought this for me on Amazon - it's normally like 45 bucks at Border's. 3. The Healthy Southwest Table. The library. 4. He Said Beer, She Said Wine, by Sam Calagione and Marnie Old. Sam's the head brewer at Dogfish Head in Delaware, Marnie is a serious wine critic. Both claim that their beverage is a better choice with your meals, and for good reasons. Got this one in an online contest for free. 5. The Wonderful Story of Henry Sugar and Six More, by Roald Dahl. A favorite from my childhood. This edition was to be thrown out during our school library's spring cleaning, so we rescued it. 6. A book of Scottish folk tales, a book called "Black Fairy Tales", and two kids books about horses. Ditto. 7. The Trumpet of the Swan, by E.B. White. Ditto. 8. Diary of a Wimpy Kid, and the sequel Rodrick Rules. These are great books by Jeff Kinney; the idea is that he's keeping a diary as a sixth grader and then into seventh. Great for pretty much all ages (as long as they can read, obviously). Borrowed from a fifth grade teacher. 9. The Encyclopedia of Animals from DK Publishing. Got this one at Costco. My kids are going to love this one next year. 10. The book club at school just finished The Fifth Child by 2008 Nobel laureate Doris Lessing. Coming up is Persepolis, and then a Janet Evanovich. 11. Two holds at the library, try to guess which is for whom: The Myth of the Rational Voter: Why Democracies Choose Bad Policies by Bryan Caplan, and The Sexual Politics of Meat: A Feminist-Vegetarian Critical Theory by Carol Adams. Politicians are like bad horsemen who are so preoccupied with keeping in the saddle that they can't bother about where they go. This sounds depressing and ominous, but I sense that one’s quality of life is not actually tied to these goods, and is certainly not tied to the automobile and all the roads and services it’s demanded for almost a century. US commuters, for example, will probably blame the Arab world, but will also look for alternate solutions, like decent public transportation, and living closer to their place of work, which is also a good thing. In fact, after some very nasty times we could — if we don’t let our anger and pain get the better of us — emerge with a better quality of life than what we have now. Welcome to the sixth installment of Pickle's Picks. Today we're operating on a Jamaican tip once again, but this time we're speeding up the tempo and turning back the clock just past reggae and stopping on ska. 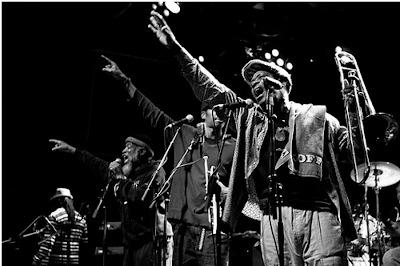 A progenitor of the roots reggae and rock steady scenes, ska typically has a swinging beat that features jazz instruments like the trombone and trumpet. 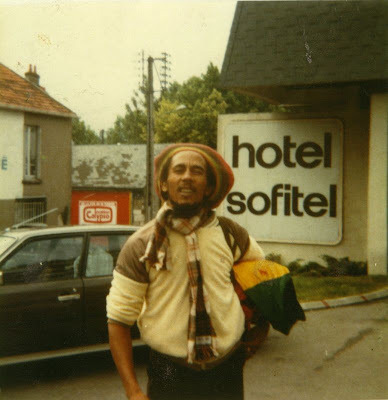 Legend tells that summer heat-induced lethargy among the islands musicians and dancers lead to the slowing of the beat and the development of rock steady, and ska's popularity faded, especially when compared to the career paths of some of its stars, including Bob Marley and the original Wailers and Toots and the Maytals. The latter group is actually credited with the first use of the word 'reggae' in their 1968 smash "Do The Reggay". Here's Toots and the Maytals in their heyday. Note the generally formal dress, which is typical of the early years of Jamaican pop, and is indicative of how much the performers initially were influenced by big band, swing, and jazz in general. After the first major rush of ska in the early to mid '60s, the genre was resuscitated by an influx of interest in the late '70s by British punk rockers, notably The Clash. In the 1990s, there was an American revival of ska that featured big horns and swinging beats, but that was very slick and geared for a music market oriented towards alternative rock. Hmm. I guess on to the music. Once again I've got the Divshare player up for streaming the individual songs, and I will post the whole thing as a zipped download for those who may want to put it on a CD or a playlist on your computer. I have done significantly less research for this project than Pickle Is The Controller, so here's my off-hand knowledge. 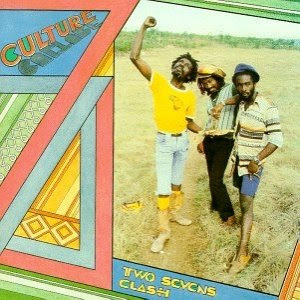 One of my favorite reggae albums is Culture's "Two Sevens Clash". This track is the first on that album, and such a great opener that I have highjacked it for my mix as well. 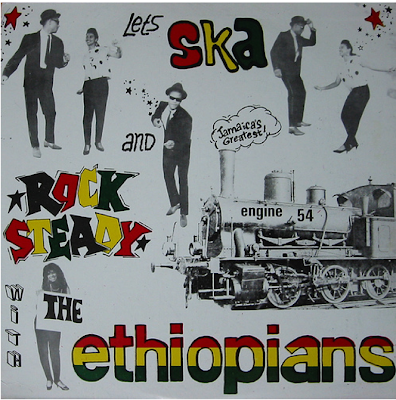 This is roots reggae at its finest, but the peppy beat and quick tempo definitely have ska overtones. "You old hypocrite. You old hippopotamus, you old hypocrite." It doesn't even make sense, but it's so catchy that you'll find yourself singing it at the oddest times. Desmond Dekker is an absolute master of ska music, a huge ambassador for reggae, and Jamaica in general. Here's "Hippopotamus", unfortunately this won't stream, as it's in m4a format here. Burning Spear really should have made the Controller mix, but I'll take a late pass and post him here. Definitely more of a roots artist, this little "skank" was in tribute the sound engineer John Burns who mixed a dub version of "Garvey's Ghost" for Spear and the band. Read more about John Burns' credits here. And peep the "John Burns Skank" right 'chere. I know very little about Tommy McCook, but the Aggrovators were a popular Jamaican backing band, specializing in dub instrumentals, very similar to King Tubby and Augustus Pablo or the Revolutionaries. "At The Dub Market" is a nice little uptempo jam not outside the vein of dub music but a bit peppier and less spacy than the Aggros typical sound. 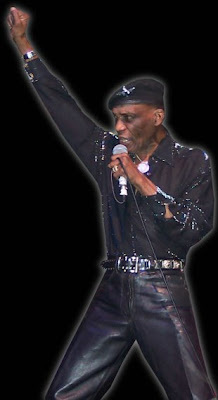 "Time Marches On" is not only the title of this super-smash song by Derrick Morgan, but also the name of his greatest hits retrospective and probably a number of biographical pieces. This song made his career, and it's pretty easy to see why. Another superstar of ska, here with his biggest hit. Again, an m4a for download. Sorry. Prince Buster is widely considered to be one of the most influential of the early sound system owners, both on the island and in Britain. "Respect" is a single that shows off the sound of most of his recording: rough around the edges, but lively and fun. I find it catchy. The Skatalites are another majorly influential group of Jamaican musicians, definitely considered a top pick as far as instrumental reggae is considered. Insofar as their names contains the word 'ska', they are the first name on many people's tongues when original ska is mentioned, and their long career is testament to their versatility and marketing savvy. 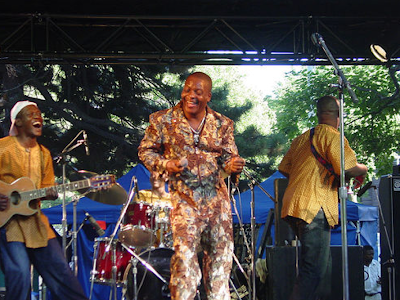 The two disc set "Foundation Ska" contains many of their early hits that anchored their careers, and is widely available at public and university libraries. Download Addis Ababa here. Tenor Saw's classic mid-'80s album 'Fever' included some dub cuts at the end on the reissue. "Rub-a-Dub Market" is a nice little uptempo dub exploration. Download here. Virtually no information online about GG's All Stars. All Music Guide lists all of one song credited to the band. This is not it, but was tagged by this band, who AMG claims is similar to the Roots Radics, the aforementioned Aggrovators, and Lee Perry's house band The Upsetters. Listen to "The Man from Carolina". Eek a mouse on stage. Major Irie was an obscure act working in the Bronx in the '80s. On the same label as Wayne Jarrett from the Controller series, for a man nicknamed Bullwackie. Here's "Keep On Running". 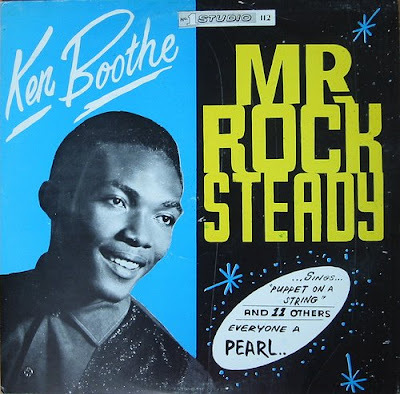 Mr. Rock Steady himself, Ken Boothe first rose to popularity as a ska duo with Stranger Cole. Found on "Foundation Ska" along with the Skatalites hits. Download "World's Fair". Rude boys, or rudies, refers to Jamaican gangsters living in Kingston's slums. 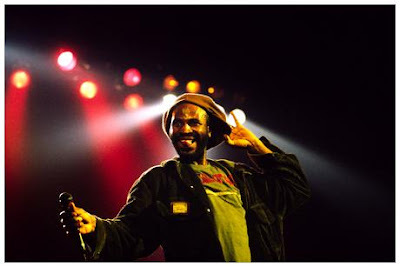 These next two songs refer explicitly to rudies, and are off the Trojan Rude Boy Box Set. It's important to remember that ska means dancing. Freddie McKay was a popular rock steady singer who worked with producers such as Coxsone Dodd and Prince Buster. Here he goes with "Love is a Treasure". Another one that's super obscure, recorded on the Wackies label. Apparently this is the only song recorded by this band. Here's Itopia, with "Do You Really Know". The Love Joys were a pair of cousins from Brixton, England. One of the very few all female roots reggae groups, they only released one album, called 'Lovers Rock (Reggae Style)'. This song "It Ain't Easy" is on a 12" record called 'Gimme Back', also released by the Wackies label. Slim Smith, another Coxsone Dodd singer, sang in a beautiful falsetto until his untimely demise at 25 years old. Here he is with "Please Stay". Finally, Toots and the Maytals, from their 2004 album 'True Love'. 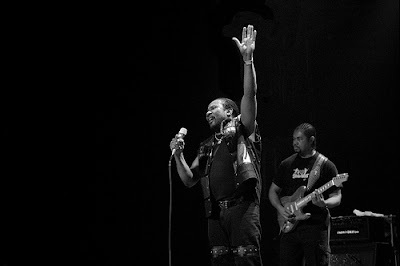 The premise of the album was that Toots' many friends in the rock, country, reggae, and R & B worlds would remake classic Maytals jams. This track features producer U-Roy and the Skatalites on horns. Download "Never Grow Old" from 'True Love'. 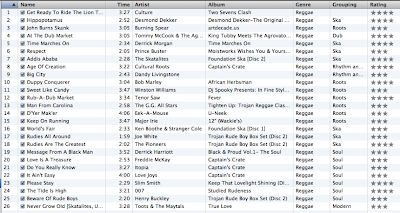 Here's the tracklisting for the mix, click here for the download. I'd be remiss not to mention it. I listened to the whole thing finally this morning, and it's quite good. If you like hip hop that leans less gangster, check this out. The theme is Seinfeld, as in the show, of which Wale is apparently a fan. At this website you can stream or download.